Are you getting a new swimming pool liner and the pool installers are requiring a lot of water? Are your holding tanks empty? Do you have an industrial project coming up that requires steady source of clean city water? Are you running pipeline and require a lot of water to make your drilling slurry or to pressure test your line? Whatever your water needs you can count on Dalton Service Company LLC to meet your bulk fresh water needs. 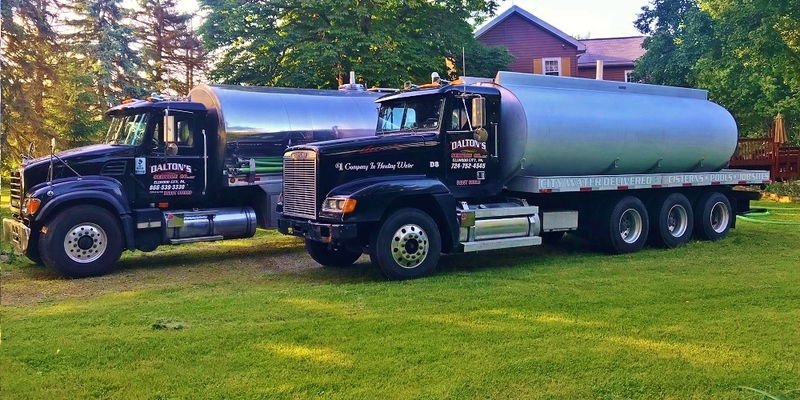 We have a dedicated fleet of water trucks which fill only with crystal clear clean city water from municipal sources so you can rest assured the water you receive from Dalton Service Company LLC. will be clean and contamination free. Once on the project our knowledgeable and friendly staff will run hose from the parking location of their truck to whatever you need filled. Our water trucks all have at least 150 feet of hose, 2 and 3 inch cam-lock adapters for both male and female, and for pools, a diffuser to disperse the water into smaller streams to help prevent damage to your pool bottom. If you need a special fitting or more than 150 feet of hose to reach the water project please alert our friendly secretary so we can do our best assisting you with your next big project.